Agrichemicals should be safely stored in order to prevent any leaks, spills or risks of contamination to people, property and the environment. Agrichemical storage must meet federal, state and local regulations, depending on storage application and the amount of chemicals being stored. For state and local regulations, check with local officials to ensure compliant onsite storage. Agrichemical storage buildings by US Chemical Storage meet EPA, OSHA, NFPA, IFC, IBC and FM approvals or Warnock Hersey standards. Agrichemical storage buildings are designed to keep people, operations and the environment safe and compliant. Storage buildings should be well ventilated with mechanical ventilation. Proper ventilation systems eliminate toxic fumes, dusts, and/or gases from storage buildings; creating a safe storage atmosphere. Storage of flammable agrichemicals may have additional regulations for fire ratings and variance allowances. Contact your local Fire Marshall to ensure compliant storage. Fire-rated agrichemical storage buildings are designed to store chemicals 10-30 feet or even inside occupied facilities or property lines. Click to learn more about fire-rated agrichemical storage. Agricultural chemicals, including pesticides, fertilizers, herbicides and fungicides are classified according to their hazards. Flammable, poisonous, corrosive, reactive are all hazardous classifications. Be sure to obtain Material Safety Data Sheets (MSDS) and product labels to understand hazard classifications of your chemical storage. 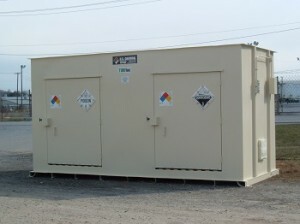 Chemical storage containers must be properly labeled to ensure personal safety. Many agrichemicals are not compatible with each other, therefore it is necessary to recognize these incompatible substances and store accordingly. Segregate incompatible storage with solid partitions or in separate agrichemical storage buildings. Flammable and oxidizing materials are incompatible and must be stored separately. A secondary containment sump must contain at least 10% of the total stored liquid volume, or 10% of the largest container of stored liquid volume. Dry agrichemical storage does not require implementation of a spill containment. Agrichemical storage buildings by US Chemical Storage are designed based on specific application. To learn more about agrichemical storage buildings from US Chemical Storage call 888-294-2729 or visit us on the web for a free quote.